Tax litigation applies in the event that you do not resolve your case at the appeals level, you have the right in order to go to trial at the US tax court. There is a calendar call on Monday, they schedule the trial for sometime during that week and we go in to present the case, witnesses are called, evidence is presented and the tax court makes a determination in the case. Tax litigation is a fight, it's a negotiation. 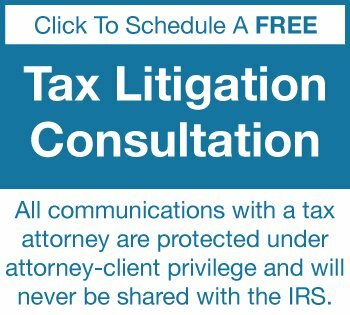 Tax litigation is a combination of the thorough organization of facts and documents, the strength of your case, the strategy and preparation of your tax litigation attorney in understanding how to present the facts of the case in a way that will put the tax payer in most favorable light, and the wits of the tax lawyer in negotiation. Experience plays a key role in preparing for tax court. Mr. Hartsock has tremendous experience as a tax litigator. Having attended every calendar call since 2009, serving as the Chairman of the San Diego County Bar Association, Pro Se Taxpayer Program. Since the 1980's Mr. Hartsock has been successfully resolving client cases at the tax court level. It is through the experiences of a 25+ year career that Mr. Hartsock has developed an intimate understanding of the strategies that the IRS will use in their prosecution and an experiential understanding of what strategies and procedural protections are available to attain the most favorable outcome for clients. Navigating the tax litigation process is a matter of knowing the tax court rules, knowing the federal rules of evidence and organizing your documents to make the best presentation possible before the tax court judge. This tax law firm has a history of very successful in tax court litigation. It is all a matter of how well you prepare the case, interview the witnesses and make the presentation to the tax court.